Economic recession in Russia, weak ruble and negative publicity around holidays in Goa are among main reasons for the Russian tourist flow’s decline to resorts of this Indian state. Financial crisis in Russia and fall of the national currency rate had a noticeable effect on possibilities of Russians to travel abroad. The number of Russian tourists visiting popular Asian and European resorts has already slumped. India was no exception. At least 40,000 Russian tourists this season have cancelled trips to the popular Indian resort state of Goa. This was announced by the legal advisor of the Russian consulate in Mumbai Vikram Varma. "According to the industry’s statistics, no fewer than 40,000 Russians who had previously made reservations in Goa hotels and resorts have cancelled their reservations and their trips to India,” he said. “One can also likewise predict a continued reduction in the number of Russian tourists in Goa for the following season." Furthermore, the Indian lawyer also suspects that the main reason for the lesser interest in the local beaches among Russians is not so much the sharp drop in the rate of the ruble, but the negative publicity that has arisen in recent years around Russian holidays in Goa. "The Russian media has widely publicized information about crimes being committed against foreign citizens, including those with the participation of Indian taxi drivers, it reduces the desire to come here", he believes. "I think that this is probably a deciding factor in the numerous cancellations by Russians and their choice of locations in Spain and Portugal. Both countries are considered this year to have more advantageous prices and better safety,” announced Varma. 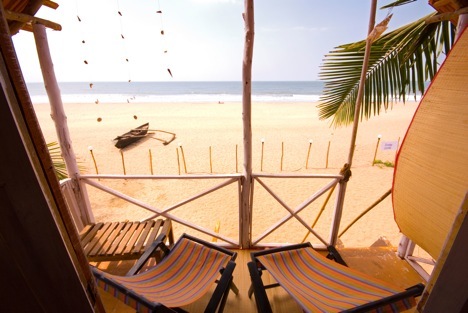 However, the damage to Goa’s image as a safe and competitively priced resort paradise has been reflected not only in its waning popularity amongst Russians but among residents of other European countries. According to the information of the Ministry of Tourism in Goa, the 2014-15 season up to now saw the numbers of holidaymakers reduce by a third compared to the usual numbers. This caused a 35 percent drop in the profits within the industry and is the reason for a mass crisis in the tourism and hotel industry. Before the crisis hit Russia last year, the Goa Tourism Development Corporation had planned to boost tourist inflow from Russia. It organized a Fam Trip (short for Familiarisation Trip) for Russian tour operators and travel agencies. The delegates came from Southwest Russia, Povolzhye and Ural regions, where Goa (and India) is yet to become a popular destination. Furthermore, introduction of a visa on arrival scheme since October 2014 had to increase the number of Russian tourists in Indian resorts. The new visa rules that allow Russian tourists to get visa on arrival at eight airports in India, including a new International Airport in Goa, solve the problem of going through an often painful process of applying for Indian visa which many people from Russian regions complain about. Materials from the Turizm.ru website were used in the report.